From the base of the human’s spine to the top of the head, you can find seven chakras. They appear like energy wheels that run through the body. It is a crucial source of the invisible energy in our bodies. The chakras keep us active, lively and vibrant every day. Therefore, at the back of our bodies, there is an arrangement of 7 chakra colors. They follow each other like the colors of the rainbow which include the red color, orange, yellow, the green, blue, indigo, and the violet color. As the emotions of the body changes, these colors also change. The chakra colors usually indicate the current emotional, spiritual and physical state of a human being. Therefore, they are vital to the human body. The chakra comprises of the main body organs and some bundles of nerves that keep flowing throughout the body. Mostly, there is a connection of colors and our body emotions. They are virtually in the form of a fluid, and if they block and stop moving, energy cannot flow in our bodies. It is because there is an intimate connection between the spirit, soul, the mind, and the whole body. If the seven chakras in the body blocks, it can lead to serious illness. All of them play a significant role in maintaining a constant flow of energy entirely in the body to avoid imbalance. 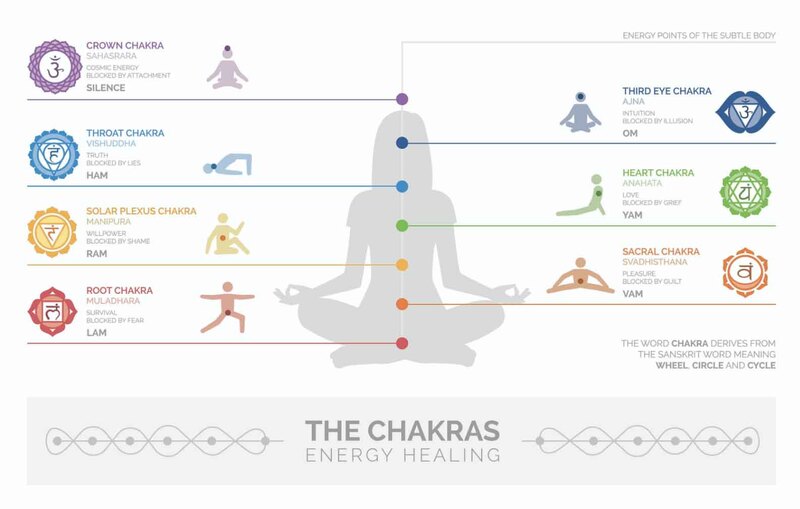 The chakras keep spinning according to the requirements of the body. We learn about the state of our body through different chakra colors. For instance, if you see a particular color, like green or orange, the body displays different emotions. The colors have a striking effect on our minds because when you look directly at the rainbow, there is clear indication of calmness after a massive storm. Therefore, we can refer color as a universal language. Below is a clear explanation of the seven chakra colors, what they represent and their meanings. The correct Sanskrit term for this type of chakra is the Muladhara Chakra. It is the red color which is the densest color in this category. It is crucial and found at the coccyx, which is the base of the spine. The root chakra defines the human’s relation to the earth. It brings a tremendous impact on our survival, vitality and also the passion. The survival issues connected here to this color may include things like money, the financial independence and basic things like food. Therefore, it represents the human beings foundation and the crucial feelings in life, of being grounded. Other people associate the root chakra with courage, power, strength, love, war and desire. Unlike the other colors, red signifies danger because it attracts more attention due to its intensity. It indicates our requirement for logic, physical strength, and orderliness. Mostly, when you are in danger, it arouses the flight response. Additionally, the smelling sense of the human bodies has a great connection with the Muladhara Chakra. There is a gland known as Gonads attached to the root chakra. The right Sanskrit word for this category of chakra is popularly known as the Swadhisthana chakra. The appropriate color associated with this type is the orange color. A good relation of the sacral chakra to the human body is the water element. The impact of the orange color in the body’s emotions is related to sexuality, creativity, desire, the reproductive system, compassion and many others. Mostly, people associate the orange color with enthusiasm, happiness, attraction and joy. You can find the chakra at the pubic bone, a place below the navel. Therefore, it is the sexual center and the primary source of creativity. It is the color of the sunshine which is always bright. Manipura Chakra is the Sanskrit word for this type of chakra. It means the jewels city. The chakra is the primary source of personal power associated with the professional success or the individual’s real life success. The yellow colors of Solar Plexus Chakra are usually associated with the charge, sun, bright fire, and high volumes of energy. These elements are essential to our body. They bring a sense of confidence in the body. Additionally, Solar Plexus Chakra enables human beings to feel cheerful, energetic and encouraged. It is also associated with producing effects of warming, joy, intellect and stimulating the mental activity of the body. There is a connection between this category of chakra and the sense of sight. Adrenal glands in the body are the organs associated with the Manipura Chakra. The chakra occupies the region from the breastbone to the navel. The Heart Chakra has an element of the air which is associated with the green colors. It has huge impacts on human beings’ relationships. Therefore, the heart chakra is the main category that is responsible for all types of relationships, including love and marriage. When there is distrust, envy, and unfaithfulness, the heart chakra weakens. It is the main reason why there are breakages of long-term relationships between loved ones. One of the senses connected to the heart chakra is the sense of touch in the body. It is also associated with nature, believed to bring wholeness into our lives. It is the source of affection and love that builds relationships. It is spiritual in nature connected to the Thymus and lymph glands in the body. It has another popular term known as Vishuddhi Chakra which may refer to true voice. The throat chakra is blue and crucial in the body and associated with the human being’s ability to listen attentively and also to communicate with other people. There are numerous glands attached to this chakra which include the jaws, teeth, throat, ears, neck vertebrae and other mouth glands. When there is a right balance of the throat chakra, we can express our feelings efficiently through communication, using a pleasant voice. It improves the artistic and the spiritual abilities in our bodies. Therefore, that is the reason we meditate when we are alone efficiently. Third Eye Chakra (Ajna Chakra) enables human beings to see the bigger picture by imagining things. The gland connected to this chakra color is the Indigo. When the Third Eye Chakra is perfectly balanced, human beings can have wonderful personalities and relate to each other effectively by sharing essential ideas. It also improves the telepathic abilities and reduces the fear of the death. The sense of thought is the one connected with this chakra. It is the main center of intuition in the body. It enables us to live focused on our daily activities. The Sanskrit word of Crown Chakra is the Sahasrara Chakra found at the crown of the head. It enlightens the spiritual connections of one individual to the others, and also to the supreme beings. The nervous system, the pituitary gland, and the brain glands are some of the vital glands connected with the crown chakra. When there is a good balance of the crown chakra in the body, an individual can have great capabilities like performing miracles, knowing the right and the wrong, interpretation of hidden things and doing many other extraordinary activities. In conclusion, when everyone realizes the essence of the seven chakra colors, we can consider the effective techniques to keep them balanced all the time. It will enable us to stay fit emotionally, mentally and spiritually. The question could be: When and how do you see these colors? I sometimes see colors in the darkness of my meditation behind closed eyes. If I do see colors, what does that mean? If I don’t see any colors, what does that mean?